Learning how to set goals you will actually achieve is a look at you and the positive steps you can take to improve your life in the ways that matter to you. When you need to set goals for anything you have to take an optimistic approach and this should be done from the heart as you need to be truthful with yourself and understand whether you can achieve your set goals. The idea is to know what you want to do and just do it, but how do you effectively reach your goals and the targets you set out? Simple, You make a plan, a strategy for your goals to never fail and you tell people about it so that you make yourself accountable if you fail and then every will laugh at you as a loser, so it's in your interests to succeed with your goals as the only person missing out on anything is you. So a plan can be something as simple as a list of 10 things to aim for like at the beginning of a new year or at the start of every month or week. It's up to you on the time frames of your goals and for you to decide how they will best benefit you in the long run. For example you can split your goals into different sets or pairs like 2 financial goals, 2 health goals and then actually try and deal with them in pairs, usually they will both go hand in hand and be easy to try and conquer by the end of your deadline. Realistic goal setting is an obvious one as you need to be planning to reach your goals and not splintering your top goal ino several unnattainable ones, like being a millionaire next month or owning a $200,000 Sports car next week. Instead it's best to start small at first with your goals and make smaller successes part of your weekly or monthly routine and then build on them. For instance if you plan on setting up a website, then surely the first step you would need to do is learn how to do that which can be a goal in itself and then all the other things like choosing a web host, a domain name can be separate but actually be a realistic goal to reach your larger main goal like having a website online and live which could mean more future goals to work on. Realistic goals work on so many levels because you can assume responsibility on what you are capable of achieving and you can pretty much cross off these goals one by one as you go along. By setting goals that will always benefit you, you are positioning yourself to succeed. The idea is to focus on what you are good at and also realise where your weaknesses are and you can sort the weaknesses out last which will need your utmost attention. The things you are highly passionate about nearly always get done first because you can do that quick without hesitation and this should spur you on to defeat those weaknesses that only you can identify on your own. Goals are like Dominoes in that when they have a direct correlation to your future success they knock over on to more goals that need to be reached and you can target broad areas of your own personal or working life much better if you can identify new things to master or beat anytime throughout the year. 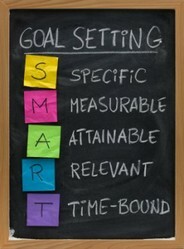 It sure is....my goals are pinned on the fridge, on the notice board and various post it notes around the house! Thanks Brenda! It's a good idea to revisit your life goals every so often. Good article. What determines, defines happiness? Is it having the most stuff? Are people living "the good life" happier than those living in a blue colared world? We can distinguish between all sorts of promises, but promise is always some sort of obligation involving at least two parties.